In short: A hardy, feature-laden and roomy SUV. Boasting a modern and masculine visage, the redesigned Honda Pilot Touring takes to both muddy trails and smooth asphalt with equal aplomb. Robust features such as a four-wheel drive, a 250-horsepower V6 engine, power-assisted disc brakes, and vehicle stability and traction controls give this eight-passenger behemoth a steady ride regardless of the circumstances. 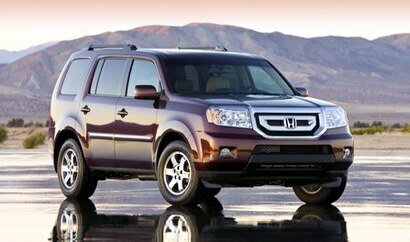 Even if this family-friendly SUV is never taken off-road, its spacious dimensions will surely invite another use. The Pilot’s leather-trimmed interior offers an airy 87 cubic feet of space when the second and third-row seats are folded, providing more than enough room for hauling groceries, luggage or furniture. In addition to being rugged and useful, this automobile also has a cushy side. Standard exterior features on the Pilot Touring include a one-touch power moonroof, power and heatable side mirrors, and an acoustic windshield with double-paned glass, which allows for a quieter drive. Inside, this SUV’s amenities include a navigation system with voice recognition, off-road tracking and a rearview camera; a Bluetooth HandsFreeLink; a leather-wrapped and illuminated steering wheel with wheel-mounted audio, cruise, navigation and phone controls; power and heatable front seats; and a 512-watt six-disc audio system with ten speakers and a subwoofer. Warranty/Service: Three-year/36,000-mile bumper-to-bumper warranty; five-year/60,000-mile powertrain warranty; five-year/unlimited-mile corrosion warranty.